Hyperikon T8 LED 4FT Tube Lights offer the highest standard in commercial lighting. These frosted LED tube lights are compatible with T8, T10 and T12 fixtures and come with free LED non-shunted tombstones, making it easy to retrofit and direct wire the tubes with a ballast bypass installation. At Hyperikon we strive to set new standards not only with the quality of our products, but also with the quality of our customer service. Hyperikon LED tube lights are covered under our 5-Year Unlimited Warranty, meaning we've got you covered no matter what. Our customer service team is available 24/7 to answer questions and solve problems. We are committed to our customers and achieving 100% customer satisfaction. ✔ INSTANT COST-SAVINGS - Reduce your energy usage and save up to 55% on your electricity bill with 18W LED tube lights as 40W-50W or F48T8 fluorescent replacements. ✔ LONG LASTING - Hyperikon LED tubes have an outstanding life rating of 45,000+ hours and are composed of durable epoxy resin and aluminum alloy. These tubes can last 20+ years depending on use, eliminating the need to frequently replace your lighting. ✔ BRIGHT, HIGH OUTPUT LED - Illuminate your space with 2160 lumens! With super bright, high output LED tubes in your garage, warehouse, or office, you will see things in a new light. ✔ FREE LED LAMP HOLDERS - Easy LED direct wire install with FREE LED lamp holders (non-shunted tombstones) included in your order. Hyperikon single-end powered tubes are compatible with T8, T10 and T12 ceiling fixtures and require a simple ballast bypass. 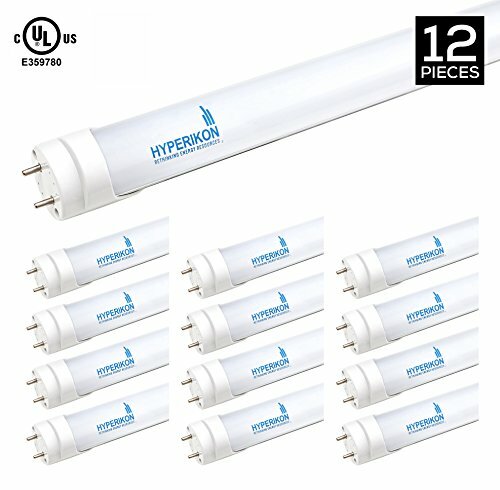 ✔ BEST-IN CLASS-WARRANTY - Hyperikon's hassle-free UNLIMITED 5 Year Warranty is unrivaled in the commercial lighting industry and covers all of our T8 LED tubes no matter what. Contact our customer service team 24/7!